The reason for Federal Reserve's existence is to maintain price stability and maximum employment. The Federal Reserve (and other Central Banks) have been 'printing' money in recent years under various code-names, including Quantitive Easing (QE 1, 2, & 3), LTRO, SMP, TWIST, TARP and TALF, in order to bring unemployment down & speed up the economy. This article explains the failure behind the current money printing scheme and how banks, not people, get the money. 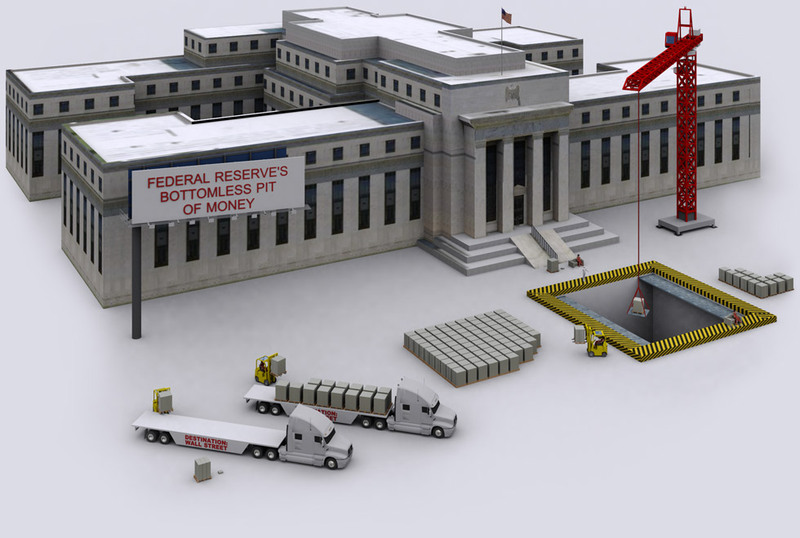 The Federal Reserve has a bottomless pit of money at its disposal. It is arguably the most powerful institution in the world- it controls the money of the Reserve Currency of the World - The US Dollar. It could destroy the world economy by simply changing the main interest rate (Federal Funds Rate), just like in '07/'08. How money printing happens: The newly printed money is just a number on the computer; printing real money is expensive. The Federal Reserve must have a system to spread the newly printed money. It spreads the money by 'taking over' existing loans; in essence buying the loans (from banks, hedge funds or other financial institutions). This system reimburses the banks the money banks loaned out before it's repaid by client, by so injecting new money into the economy. Government loans (treasury bills, securities, bonds, etc), MBS (Mortgage Backed Securities- home loans), student loans, credit cards and auto loans and many more. Little known fact: All money is debt. All money is loaned into existence. Banks create (90%+ of all) money by making a "Reserve Requirement" deposit with the Federal Reserve. If a bank deposits $1 million with Federal Reserve, with a 10% Reserve Requirement it can loan out $10 million by simply typing it into the computer into an account. This is called Fractional Reserve Banking. Federal Reserve also works as a lender of last resort when the banks that loaned out 10x more than they have deposited, get a 'run on the bank' and can't come up with the money-- when more people are pulling it out than they have available. Federal Reserve protects the system that allows lending out what one does not actually have. Federal Reserve is also a private bank, privately owned and not responsible to the Government, or anyone, except possibly its 300 private share holders. This might sound confusing, but money-creation is not taught in schools, therefore many completely lack the concept of how the system works. The economy text-books of today are Keynesian theory based-- "print more cash please", written by big corporations, such as McGraw Hill-- which are owned by the banks. Banks benefit from this system, and from you not understanding it. There are many videos and sites covering the concept of money creation. 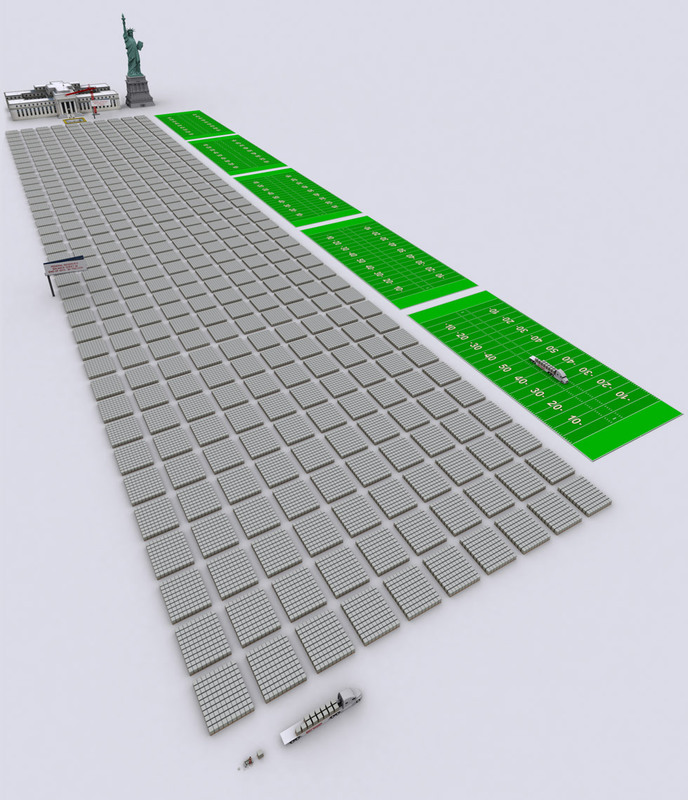 You are looking at little over $13 Billion dollars getting ready to be transported out, into the economy. 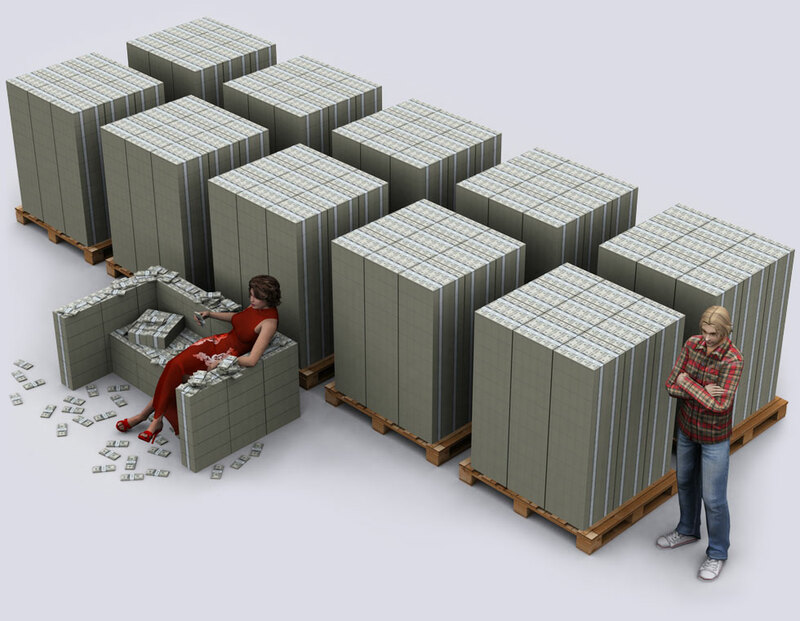 Each pallet of $100 million dollars weighs exactly 1 ton (minus the pallet). The trucks shown carry 20 tons of cash. Legal carry weight is usually between 22-25 tons. Federal Reserve to print $40 billion a month for remainder of 2012. 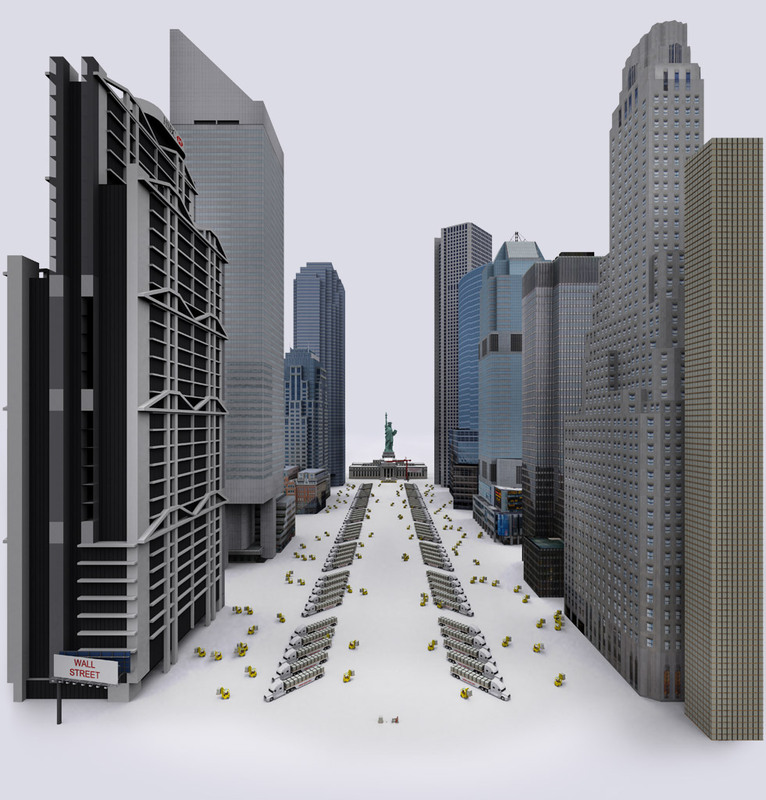 In September 2012, the Federal Reserve started its 3rd QE economic stimulus program. Under this program Federal Reserve will for the rest of 2012 buy $40 Billion a month, each month, in MBS (home-backed loans) from the market, by so infusing new money into the economy. $40 billion a month would amount to 9,600,000 jobs paying $50,000 / year. Unfortunately, more money does not equal more jobs. The newly printed money is not getting loaned out to consumers (as intended by the stimulus package) but stays with the banks and the banks invest the newly printed money in stocks for fast profits, by so pushing the stock market higher. The money does not go to SBA Bonds that are aimed at pumping cash into small business sectors. 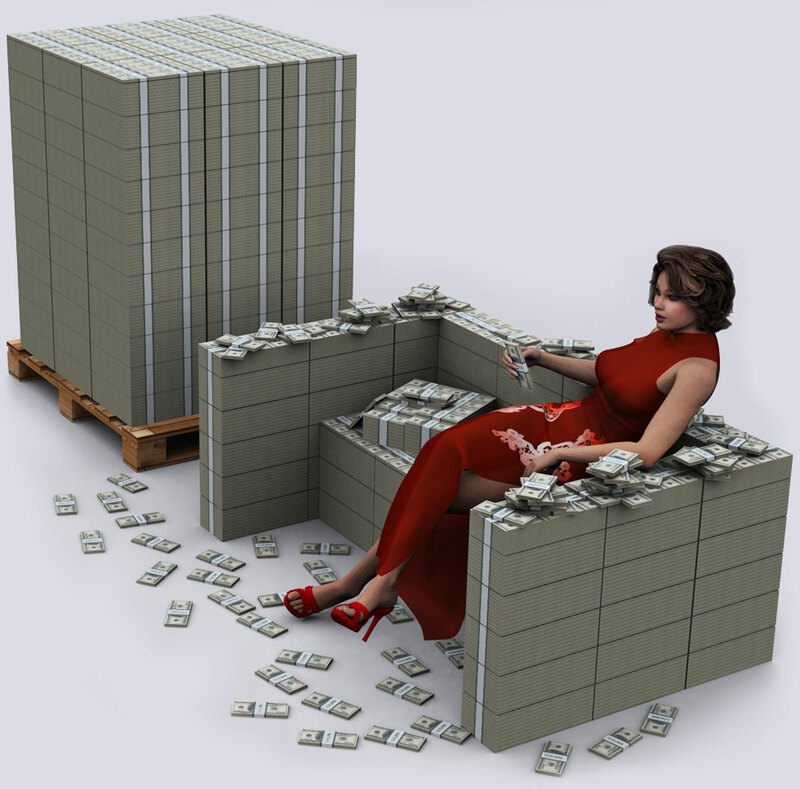 Above is the projected Federal Reserve printing volume of dollars for 2013. 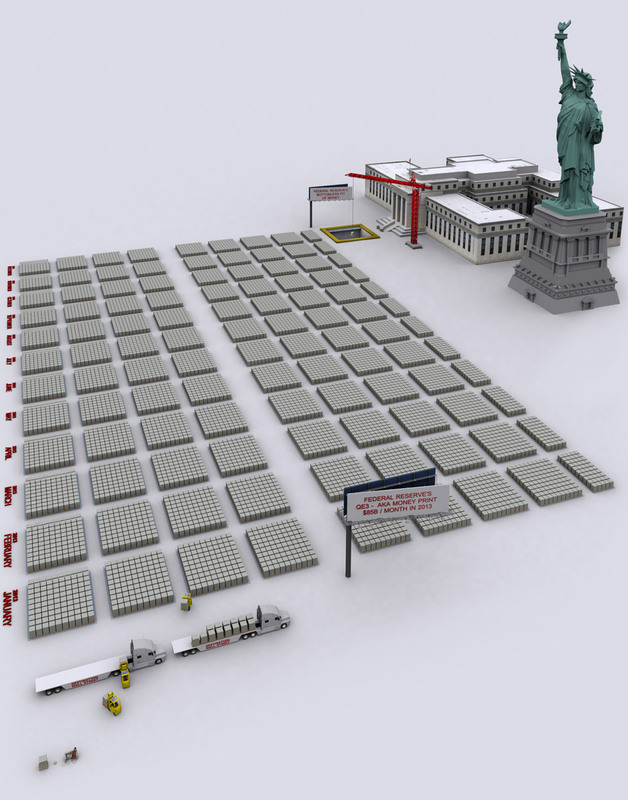 Federal Reserve intends to print $1020 Billions ($1.02 Trillion) in 2013. This is equivalent to 20.4 million jobs per year paying $50,000 / year. As explained above, the Federal Reserve's Balance Sheet is the amount of assets The Fed has purchased (removed) from the free market in order to stimulate it. The Fed owns as of 2012-10-06, 27.2% of the bond market. Eventually the Federal Reserve must reverse the flow of assets and start selling them or inflation and price instability kicks in. This reverse flow would deduct at least 24% of GDP, when it happens. Federal Reserve is left with a catch-22, because it contradicts their mandate by-law of price stability and maximum employment. The Federal Reserve's economic models are now broken as The Fed is as of September 2012 shocked its models predict "Explosive Inflation", but reality does not show it. One of the reasons there has not been an explosive inflation is that there is a little known, but massive by size, Shadow Banking System, a place where 'credit-money' is created by the banks, for the banks and does not enter the real economy by so being protected from causing inflation. The Shadow Banking system has been deleveraging since 2008 and needs to sell assets to come up with the money to pay back others. This new money comes from the Fed, but now enters Banks' real balance sheets, and is pushed into stocks for quick profits, pushing the stock market higher, by-passing the consumer. Federal Reserve must print at least $3.9 Trillion more before the Shadow Banking System is stabilized. Welcome to Wall Street, the capital of the free market. It is full of semi trucks today. JP Morgan Chase, CitiBank, Bank of America, Goldman Sachs, HSBC, Wells Fargo, Morgan Stanley, State Street Financial and Bank of New York Mellon. 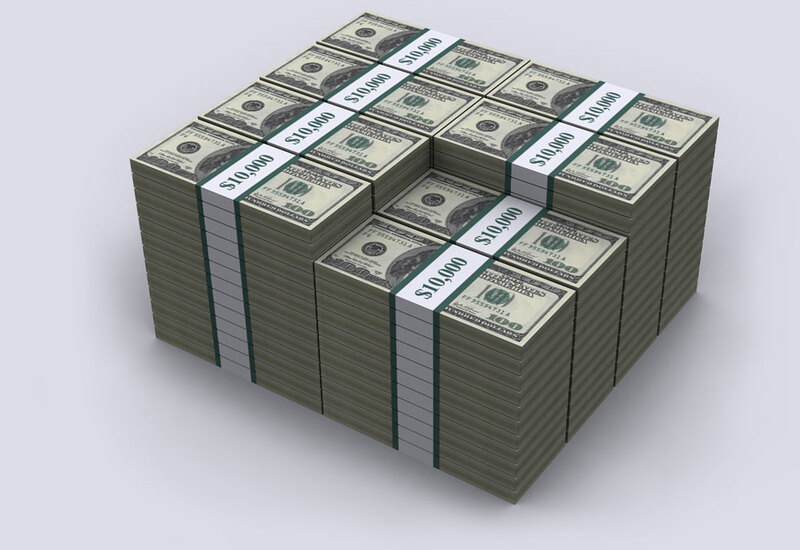 The 2013's stimulus package (QE3) of $1020 Billion Dollars has been nicely stacked on the far right side, awaiting 2013. Each economic boost through money printing (QE1, QE2, QE3) has diminishing effects, that appear to follow the Fibonacci equation. This implies that the Federal Reserve is now caught in a perpetual cycle where it has to print near exponentially more money just to maintain same stock market performance level, not mentioning inflation. . Verdict: Truck drivers and fork-lift operators on Wall Street have good job security as QE4 is now a certainty. The money printed by the Federal Reserve does not end up the hands of the people, but goes directly to the banks, though whom it ends up in the stock market in order to inflate asset values. This pushes the Dow Jones Industrial Average and S&P higher, but does NOT increase hiring and above all consumer spending, which is one of the main drivers of the US economy. 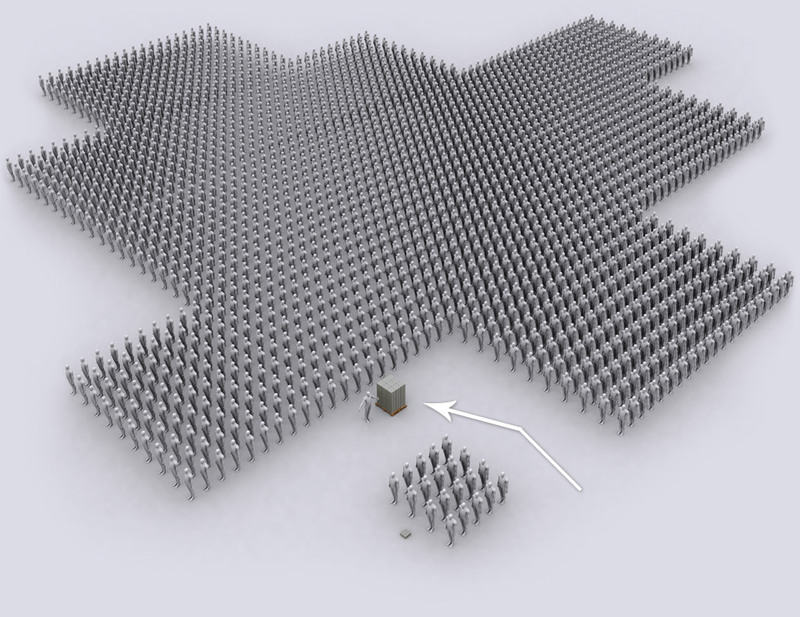 Money print QE3 is equivalent to 20.4 million jobs paying $50,000 / year. Instead the money goes to Wall Street and the stock market. 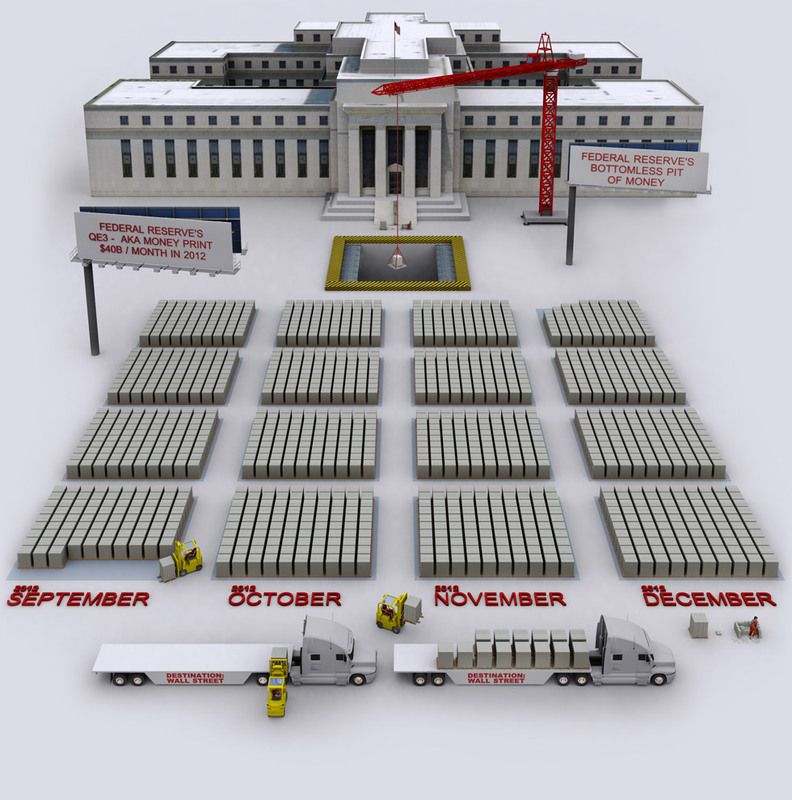 This is where Federal Reserve's newly printed money ends up. Familiarize yourself with Wall Street by reading our Derivative Casino page.